A lot! But, more specifically, the notion that computers are about to replace us at any moment. Admittedly, I am way behind. I finally watched Desk Set last night. 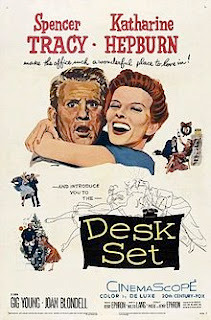 The movie was released in 1957 (*swoon worthy mid-century modern furnishings) and follows the Reference Department at the Federal Broadcasting Network through a scare that it will be replaced by a computer. I identified with the Reference Department in the movie as facing some of the same issues in 2015. Bunny Watson (played by Katharine Hepburn) is head of Reference when an impending computer purchase is threatening to replace her and the rest of the Reference staff. The Reference Department is very busy with the phone ringing off the hook (when phones actually rested in a hook). The Reference Department's knowledge base is very impressive - using a stereotype of librarians that I can get behind. It was plain to see that the types of questions the Ref Dept answered in 1957 could easily be answered with a simple Google search in 2015. But the overall idea that computers cannot make the same types of connections as the human brain still rings true - especially when analyzing the law. We may find ourselves in a time when Ross can retrieve cases and statutes for us, but we won't be at a point anytime soon where we find that Ross can analyze an intricate set of client facts and compare those facts to case precedent and statutory interpretation to argue a result. To do effective legal research, a lawyer must build on her knowledge of the law to issue spot facts and identify the relevant law. The lawyer must find statutes and cases that offer an analysis of the law to the set of facts. This often requires making tough analogies that force the lawyer to build on the analysis and fill holes through additional research to advocate successfully for a client. It's not enough to find a case citation or the correct statute on point. It takes special skill to find the law and use it effectively. This is not something that machine learning or artificial intelligence is capable of, yet. While technology is stronger than ever before, this movie reminded me that librarians have been facing the threat of extinction by computer for a very long time now. Yet we are still here and thriving. And we will still be here and thriving for many years to come.